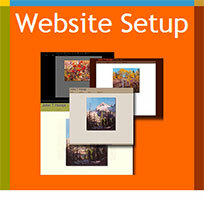 ARTsala allows you to update your inventory information and your personal website at the same time. If you've signed up for our Inventory Management + Website account, you can have your personal website up and running with only a few minutes of setup. If you haven't signed up for an ARTsala website, upgrade now! Navigate to the Website Setup page by clicking on the website setup link on the top navigation menu, or by clicking on the website setup block from your account control center. 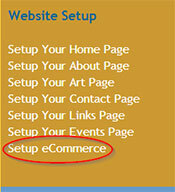 At the top of the Website setup page, you will see your Website Status. If you've upgraded your account to include website hosting, you will see a message guiding you through the website setup process. 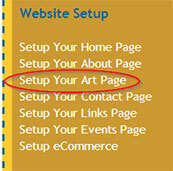 Follow these instructions to link your web address to your ARTsala website. (These instructions will be customized to your account). If you haven't upgraded to an ARTsala website you will see an invitation to upgrade. We're persistent! Once you've completed the process of setting your URL (web address) to point to our servers, you can setup and preview your website. 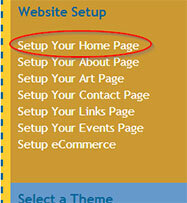 Begin by setting up your Home Page. A number of design layout elements appear on your home page. The first is a custom image. You can select and upload any image you would like to appear on your home page. This image should be a jpg or other web image saved as RGB (not CMYK). Image size isn't critical here because we will resize larger images to fit on your home page. 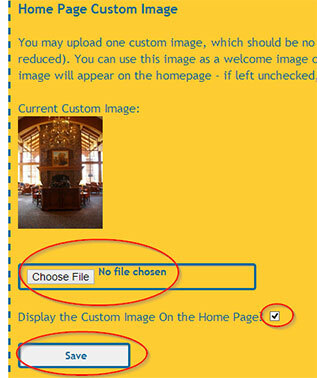 After choosing an image for upload, you should also check the "Display the Custom Image on the Home Page" check box. (if you ever want to hide the image on your home page, you can uncheck this box). Important! If you are uploading a home page image to replace a previous image, and the old image won't disappear, try clicking the refresh button on your browser to reload the page. You may also create a slideshow of your work on the home page. To do this, you should already have uploaded the artwork you wish to use in the slideshow (see our Adding Artwork guide if you need help uploading). 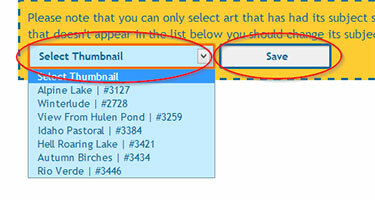 Use the drop-down menus to select the artwork you wish to display in your slideshow and click the "Save" button when you are finished. Finally, you may add a greeting message to welcome visitors to your site. The interface for entering your welcome message is a lot like word processing software. You may type your message in plain text, or you may format the text as needed. We recommend keeping formatting to a minimum, to avoid conflicts with your site design. 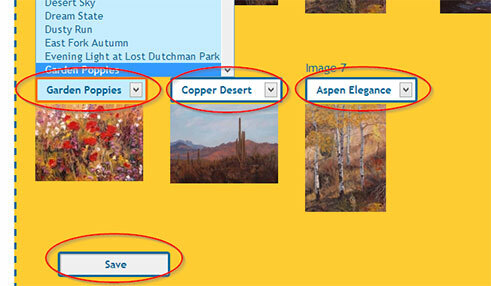 If, for example, you change the color of the text, your text may not display as desired on some ARTsala site themes. IMPORTANT!!! If you are copying your text from Microsoft Word, please make sure that you use the special paste from Word button on the tool-bar (instead of ctrl+v or command+v). Word adds a lot of markup to its text. The markup helps display the text the way you want it in Word, but it wreaks havoc online. The paste from Word button strips out most of the markup and gives you clean text. Be sure and click "Save Greeting" when finished entering your greeting (and before doing anything else). You are now finished setting up your home page and can return to your website setup page menu to setup the rest of your pages. You will be taken to your account profile setup page where you enter your biographical information, artist's statement, resume and portrait. 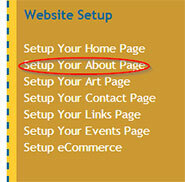 To learn more about setting up this page visit our Profile Setup Guide. Open your Art Page setup. Complete two tasks on this page. 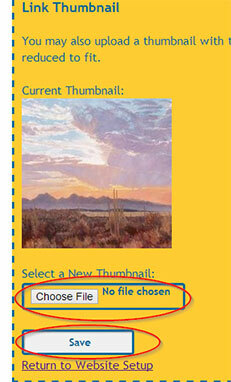 First select a thumbnail image for each subject matter type on the page. Next, set the order the subjects will appear on your art page. The default is for the subject matter to appear alphabetically. If you wish to have a custom order, enter numbers in the order field in the order in which you would like the subjects to appear. 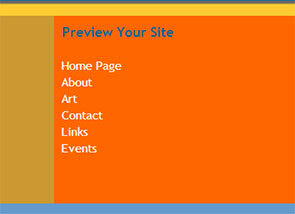 The art page will sort the subjects from lowest to highest by the numbers you enter. Be sure and click the "Save Order" button after you enter each number. Return to your website setup page. Contact Page. Your contact page is critical, as it will allow website visitors to get in touch with you if they are interested in your work. 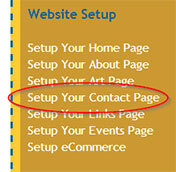 Select the Contact Page setup link. If you have set up galleries/venues that show your work, you will see a list of them here, and you may select which ones you want to have appear on your contact page. If you want to add additional galleries, or change the contact information for a gallery, please see our Gallery/Venue Setup guide. Now, you can select whether you want your personal address to show up on the contact page. Remember, this address will show publicly if you check the box. 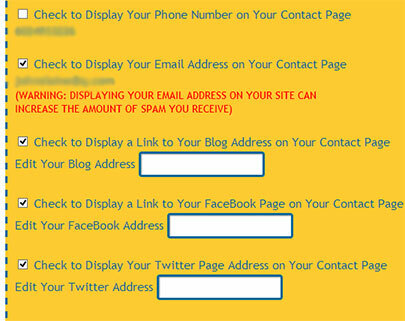 If you don't wish to have your address shown on your website, leave the box unchecked. Next, you can decide if you want your phone number, email address, and social media links to appear on the site. The contact page has a mail form that visitors can use to email you, so we recommend that you not display your email address on your website. Displaying your email address can dramatically increase the amount of spam you receive. Finally, you can add custom contact information to your contact page. See the warning above if you are pasting from word or considering formatting the text on your contact page. 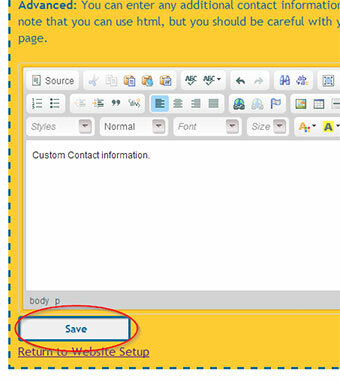 Click "Save" to save all of your contact page preferences. Links Page. 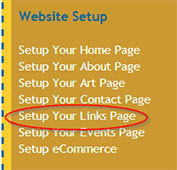 You may include a page of links to friends' websites, causes that you support, art websites, etc. Adding links is easy. If you don't include any links, the links page won't appear on your website or on your navigation bar. To add a new link, click on the "Create New Link" button. Enter the link information, including your name for the link, the website address (you don't need to include the http://, just www.website.com), and the link description. You may also select an image to display with the link, if you wish (optional). Click the "Save" button to save the link and upload the image. Events Page. 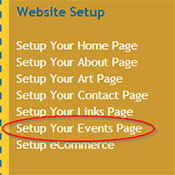 You may announce your upcoming events on your ARTsala website. This is the perfect way to let your followers know about upcoming shows and other events. The best part is that ARTsala will automatically remove events from your site once they are over, and the events page and link hide if there are no upcoming or current events. Enter the details of the event, including an image if you wish. Please note that both a start date and end date are required. 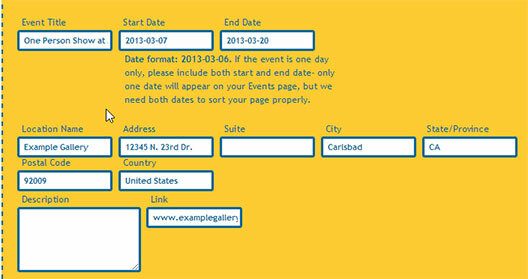 If an event is only one day, enter the same date for both start and end dates. If desired, you may also upload an image for the event. 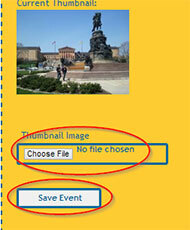 Click the "Save Event" button to save your event info and upload your event image. Once events are added to your account you may edit them by returning to the Event setup page and clicking on the Edit link for the event. Note that both future and past events will appear on this page. E-commerce. 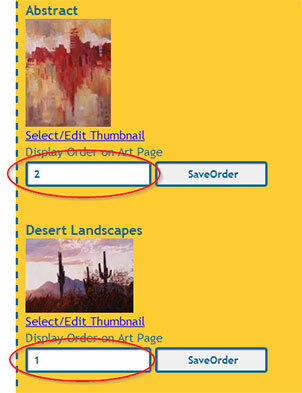 ARTsala allows you to add PayPal to your site with the click of a button. Follow the instructions on this page to enable PayPal on your site. Important! Make certain the email address you enter is the address you used to set up your PayPal account. An incorrect address can cause your sales funds to be misdirected. Please note, that only artwork that shows a status of "Available" will show a PayPal buy now button. Finally, you may select the theme for your website. The theme will act as a kind of skin for the website and will determine the appearance of the website. 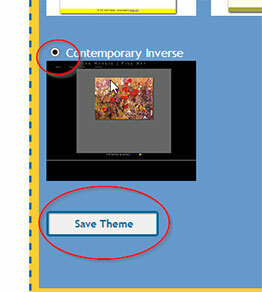 You may select your theme by clicking on the image or radio button next to the theme, and click "Save Theme". See what your website will look like. Now that you have set up your account, you may preview the website. You may do this even if you haven't subscribed to ARTsala's website hosting.